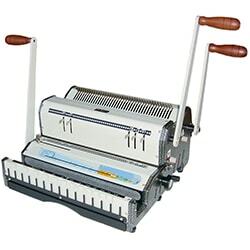 The Akiles WireMac series of wire-o binding machines are some of the most popular choices for customers of all sizes; from personal and small offices to small printers. 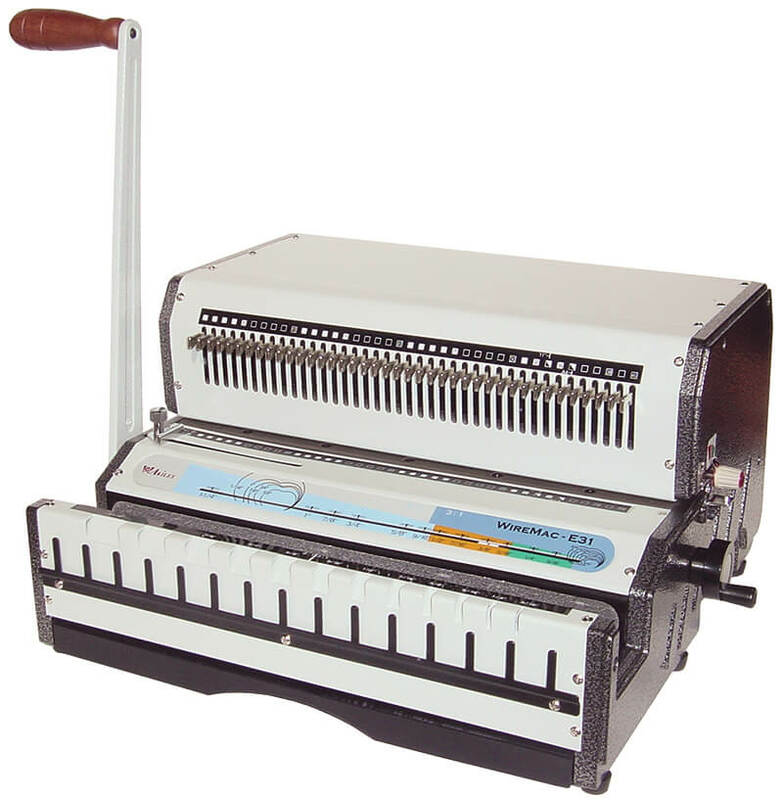 The WireMac series of wire binders includes the WireMac-M, a manual wire binding machine and closer available in either a 3:1 pitch or 2:1 pitch model, the WireMac-E, an electric wire binding machine and manual closer available in either a 3:1 pitch or 2:1 pitch model, and the WireMac-Duo, which is a manual punch and bind that allows for both 3:1 and 2:1 pitch in the same machine. In this article we will compare and contrast these three wire binders so that as a consumer, you can make the correct decision for your particular needs. Dimensions 16" x 16 ½" x 16" 16" x 16 ½" x 16" 16" x 16" x 20"
The Akiles WireMac-M is a perfect solution for businesses looking to bind professional looking documents in lower volumes, at a great value. The WireMac includes several features designed to make low to mid-volume wire binding easier than ever! The Akiles WireMac-M renders efficiency and productivity. It features a full range of functions and mechanisms that were specifically designed with one simple goal in mind: to fully meet the needs of the small to mid-sized office wire binding industry! 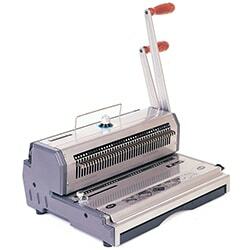 The WireMac Binding Machine is a hole punch and double loop wire binding machine all in one. 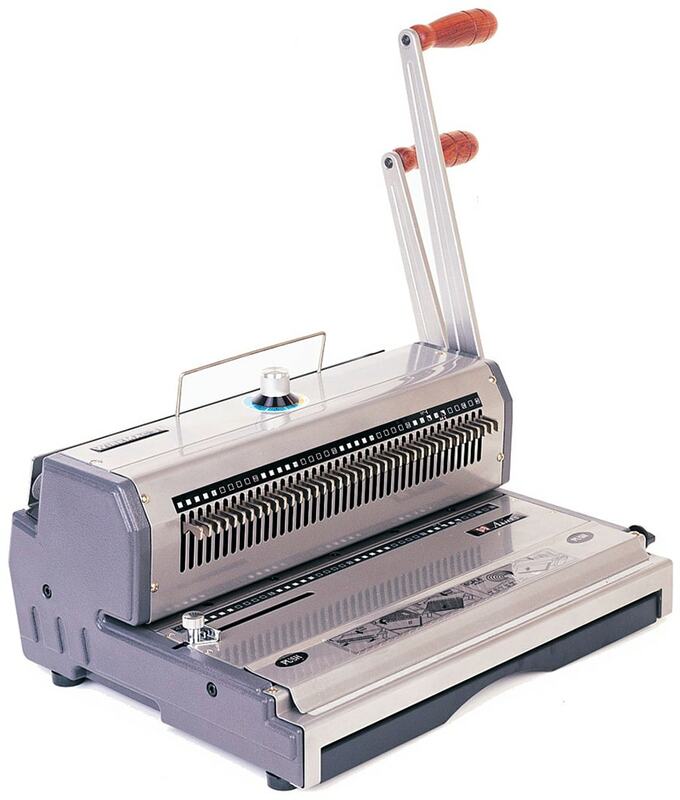 The WireMac-M Binding Machine features disengageable pins, which eliminate half hole punches on sheet sizes other than the 8.5" x 11" letter. This feature is essential for anyone binding non-standard document sizes. In addition, its open ended 14” punch allows for over sized documents with ease by simply punching your sheets twice. With the Akiles WireMac-M, you can punch square holes in a 3:1 or 2:1 pitch through as many as 20 sheets of paper (20 lb.) at a time with double loop wire-o, giving you the capability to bind as many as 280 total sheets (20 lb.). A diameter guide to help you select the correct Wire-O size for your book thickness is included on the machine, and you can also adjust the margin depth to control how deep your holes are punched into the paper. The WireMac-M measures 16” x 16.5” x 16”, and can fit on most any table or workstation, and it weighs about 40 lbs. With sturdy construction and a full range of function, the WireMac Binding Machine is a great choice for your low to medium-duty punch and binding needs. 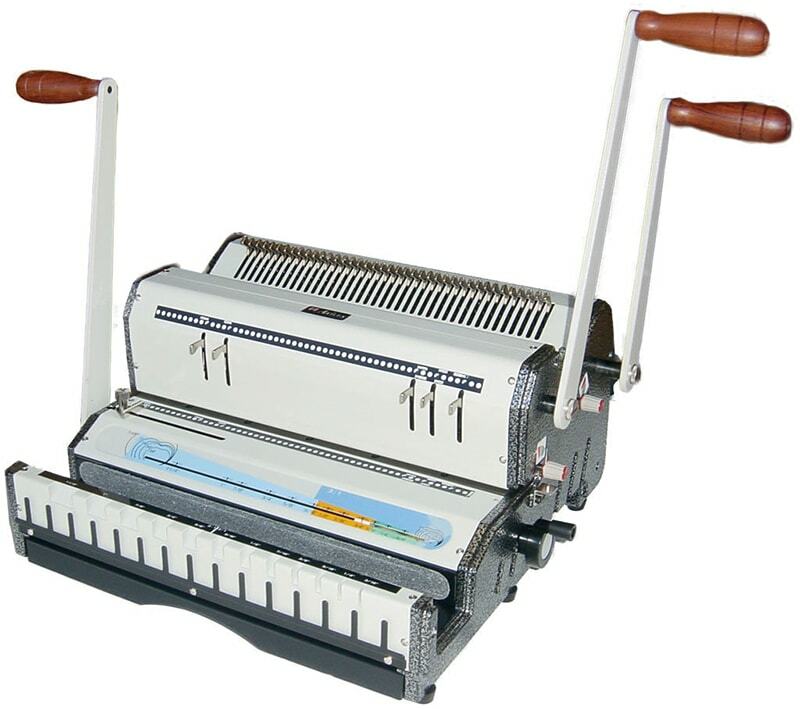 The all-in-one WireMac Duo is a unique wire binding machine that punches and closes both, 3:1 pitch wires and 2:1 pitch wires. The Akiles WireMac Duo is based on the best selling WireMac-M, but has gone one step further in providing both kinds of punching patterns in one compact machine. The WireMac-Duo has both die sets installed in one single unit, with no need to change dies. This new Wire Binding System is all you need to punch and wire bind from 2 sheets to over 200 sheets. All punching pins on the Akiles WireMac Duo dies can be independently disengaged, allowing for punching of any size document, while preventing partial side-end perforation. In addition, it features a 14 inch open ended throat that allows for over sized documents by simply punching your sheets twice. With the Akiles WireMac-Duo, you can punch square holes in a 3:1 or 2:1 pitch through as many as 20 sheets of paper (20 lb.) at a time with double loop wire-o, giving you the capability to bind as many as 280 total sheets (20 lb.). A diameter guide to help you select the correct Wire-O size for your book thickness is included on the machine, and you can also adjust the margin depth to control how deep your holes are punched into the paper. The WireMac-Duo measures 16” x 16” x 20”, and can fit on most any table or workstation, and it weighs about 50 lbs. The WireMac-Duo Binding Machine is a great choice for your medium-duty punching and binding needs where a wide range of book thicknesses are required. The Akiles WireMac-E offers efficiency and productivity in one easy-to-use Wire-O binding machine. With its heavy duty punching motor and complete system of functions, the WireMac-E makes wire binding fast, easy, convenient and professional, making it the ideal machine for medium to heavy volume workloads. The Akiles WireMac-E features state of the art mechanisms that were specifically designed with one goal in mind: to fully meet the needs of the wire binding industry. The WireMac E Electric Heavy Duty Wire Binding Machine is one of the most powerful electric wire binding machines on the market. It is available in either 3:1 or 2:1 pitch, is capable of punching up to 20 sheets of 20lb. paper, and includes a heavy duty wire closer that is capable of closing wire as large as 1-1/4". The WireMac-E features fully disengageable die pins offering clean and complete punching with different paper sizes. In addition, it features an open-ended throat, so you can even punch sheets larger than the specified 14" length. The Side Margin Control provides and evenly centered punch for all document sizes while the wire holder keeps the wire in place for easier inserting of sheets. The WireMac-E is foot-pedal operated; leaving both hands open to prepare your next book. It also features a diameter guide that measures your book thickness and tells you exactly what size Wire-O you will need to get the job done. The wire closer is adjustable so that you can achieve an exact and secure close every time. The reverse function works as an anti-jam feature for trouble free punching. The Akiles WireMac-E is fully featured, reliable, powerful, and best of all, easy to use. . The Wiremac-E measures 16” x 16.5” x 16”, and can fit on most any table or workstation, and it weighs about 64 lbs. The WireMac-E Electric Wire Binding Machine is the perfect choice for your heavy-duty punching and binding needs where a production speed and efficiency are required.